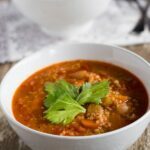 Vegetable and Lentil Soup was a winter staple in my family home growing up. I loved it then, and I still love it today. The best thing about this soup is that it does not require too much adapting as it is already quite healthy. It is loaded with lentils, carrots, celery and tomato. The traditional version that I grew up with included pasta, which in this version I have replaced it with quinoa. I really like quinoa in soups as a rice or pasta replacement as it holds its texture very well and does not become soggy like rice or pasta can. Both my 2 year old and 3 year old love this soup, in fact they seem to be fans of all the soups that I have been making (high fives all around). So, if you are looking for ways to give your children more vegetables, make sure you give this soup a try, as well as my Roast Pumpkin & Coconut Soup and Chicken & Vegetable Soup. I also have quite a few more soups that I am making over the next few weeks and I look forward to bringing you those. Heat oil in a large saucepan over medium-high heat. Add onion and garlic and cook, stirring, for 3 to 5 minutes or until onion is translucent. Reduce to a simmer and cook covered for 1 hour. In the last 20 minutes, add the lentils and quinoa. In the last 20 minutes, add quinoa.